NABARD Development Assistants Recruitment Admit cards 2018: National Bank for Agriculture and Rural Development has issued Development Assistants recruitment notification 2018 and Applications are invited for the post of Development Assistants in the Rural Development Banking Service (RDBS) in National Bank for Agriculture and Rural Development (NABARD). NABARD has released the admit card or call letter for the prelims examination for the recruitment of Development Assistant. 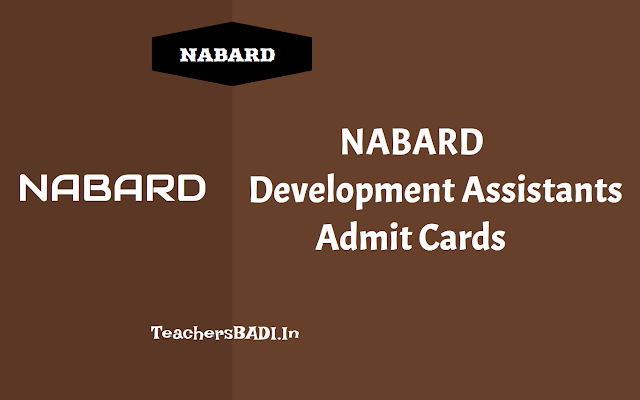 The NABARD admit card has been released now for the examination which has been scheduled for September 29, 2018. A link has been provided on the official website of NABARD's career section to download the admit card. The admit card link is available on the website, nabard.org. NABARD or National Bank for Agriculture and Rural Development had earlier invited applications from graduates for recruitment to 62 posts of Development Assistant. Online registration for this recruitment was open till September 12, 2018. Step III: Go to this section "Recruitment of Development Assistant - 2018 - Preliminary Examination on 29th September 2018 - Call Letter"
Step IV: Click on the link "Link for Call Letter Download"
The examination would be conducted on-line i.e. on a computer. Papers of Preliminary Examination (except the test of English Language) will be set bilingually in Hindi and English. All the questions will have multiple choices. Out of the five answers to a question only one will be the correct answer. The candidate has to select the correct answer and 'mouse click' that alternative which he/ she feels is correct. The alternative/ option that is clicked on will be treated as the answer to that question. Answer to any question will be considered for final evaluation, only when candidates have submitted the answers by clicking on "Save & Next" or "Mark for Review & Next". NABARD Development Assistants: NABARD - 62 Development Assistant Posts and Last date is 12.09.2018. National Bank for Agriculture and Rural Development(NABARD) invites applications for the post of Development Assistant. Qualification: Bachelor’s Degree in any discipline with minimum of 50% marks in aggregate. Age (as on 01.08.2018): Between 18 and 35 years. Bachelor’s Degree in any discipline with a minimum of 50% marks in the aggregate & the knowledge of word processing on Computer. Age Limit: Candidates should have between 18 to 35 years as on 31.07.2018. (Selection process: Based on Preliminary and Main Exam.) The selection process will involve two phases viz. Preliminary and Main Exam. Both the exams will be held online. How to apply: Candidates may apply online through website. Candidates can apply online only from 30 August 2016 to 20 September 2016 and no other mode of application will be accepted. Last date for online registration: 12.09.2018. Phase-I (Preliminary) & Phase-II (Main) – Online Examination: September/ October 2018.